The Old Churchyard on Vicarage Hill is a peaceful unspoilt part of Farnham. The Bourne Conservation Group (BCG) has for some years been responsible for looking after the site on behalf of the church of St Thomas-on-The Bourne, during which time many overgrown and invasive plants have been removed. The aim has been to make the Old Churchyard more welcoming to both people and wildlife, while respecting the historic nature of the site and the memory of those buried there. An important part of the project has been to research the names and stories of those former parishioners, with much carried out by local historian Wendy Maddox. Sadly, Wendy died a year ago. The lychgate is the historic entrance to the churchyard, but the surface through it had remained unchanged since the 19th century and was rough and muddy in bad weather. At the end of 2018 BCG replaced this surface with stone paving which was generously funded by a donation from John Maddox in memory of his wife. 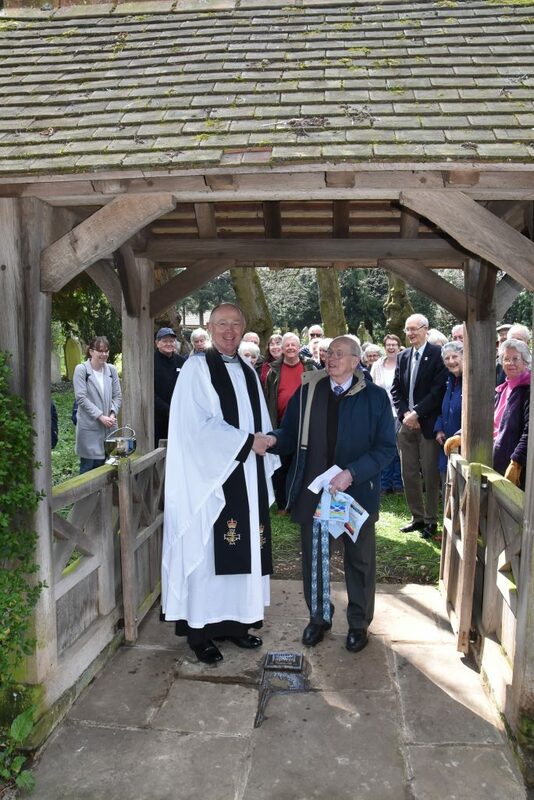 On 10th April a ceremony was led by the Vicar of The Bourne, Revd John Morris, to dedicate the new paving, with a plaque being unveiled by John Maddox in front of a good crowd of BCG members, parishioners and friends and relations of the family. Noel Moss, Chairman of BCG, gave a short address about Wendy’s contribution to our knowledge of the area. All were agreed that the new paving will make the entrance to this historic site more welcoming and be a suitable memorial to Wendy Maddox. The timing was appropriate, being a few days before Palm Sunday when each year a short service is held in the Old Churchyard before processing to the church led by Twinkle, the donkey.